The Harley-Davidson Fatboy fairing attaches to your factory quick disconnect windshield brackets. There are 2 different factory windshield brackets for the Fat Boy, Wide (with light bar) and Narrow (without light bar). Our fairing is made for the wide windshield with light bar. Fat Boy without light bar may need to use spacers. Nacelle headlight: This will work with this fairing too. We would need to know if you have changed your headlight out and if you have changed the front forks to a Road King. The fairing will not work with any aftermarket windshield brackets. 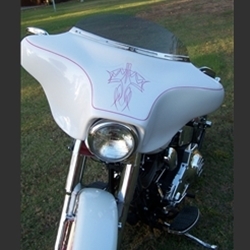 Some of the older Fat Boy's may need 2 ½ “Custom Pull Back Risers for 1” handle bars. You will want to roll back or pull back the factory handlebars that are installed. Handlebars: Ape handlebars will not interfere with the fairing. The handlebars will be closer to the fairing at the top. They need to be in line with the fork tubes and not pushed forward. The bottom width of the handlebars can't be more than 15"across; this will make the handlebars hit the inner speakers. Digital Media Receiver AM/FM Tuner w/BlueTooth, Front Panel USB & Aux in.